A new British record was set at the UK Para-Powerlifting Open when the national competition for disability bench press came to Middlesex University for the first time. The event saw the new record set in the Women’s 50kg class in para-powerlifting by Team GB lifter Natalie Blake. Great Britain international athletes competed alongside club-level para-powerlifters at Middlesex University on Sunday 7 December as they continued their journey to qualify for the Rio 2016 Paralympic Games. The event saw a number of high profile lifters come to Hendon and pick up medals, including Natalie Blake (Commonwealth Games 2014 silver medallist) who enjoyed a series of successful lifts to post the new British record of 97kg in the Women's 50kg class and take the gold medal. Ali Jawad (world record holder, World Champion 2014, Commonwealth Games 2014 bronze medallist) was awarded a gold medal for hitting 190kg in the Light Men's group, and Paul Efayena (highest competition bench press in the UK) took gold, making 180kg in the Heavy Men's group. The competitors aimed to achieve the maximum weight for the bench press, which consists of pressing a weight upwards from a lying down position. Powerlifting is a strength sport similar to weightlifting, but differs in the types of lifts required by their athletes. Middlesex Strength and Conditioning, and Sport and Exercise Rehabilitation students were able to get valuable experience from the competition by providing physiotherapy and rehabilitation support, putting their knowledge to practical use and further developing their experience working with elite athletes. The Middlesex University Weightlifting Club also assisted at the event as loaders for the disabled powerlifters. 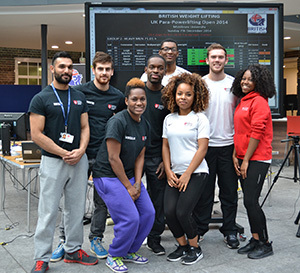 Middlesex University Deputy Head of Sport and Recreation, Stella Sipple said: "It was an inspiring event, which the students were able to really benefit from. Working on elite athletes and competitions will set them apart from the rest when they begin their careers. We hope to continue working with British Weight Lifting, opening up elite sports to more of our students." British Weight Lifting Talent Pathway Manager Dan Wagner said: "Special thanks to Middlesex University for their ongoing support and contribution to British Weight Lifting and para-powerlifting, including providing volunteers and a fantastic facility to host the event."